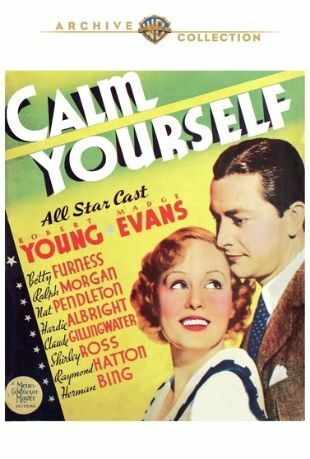 Calm Yourself starts off as ace advertising man Pat (Robert Young) is fired from his job when he offends the highly offendable -- and none too likeable -- Mary Elizabeth (Betty Furness). This segues into a phony kidnapping scheme that thrusts Pat and Mary together, furthering their mutual animosity. Fortunately for Pat, heroine Rosalind (Madge Evans) is an agreeable sort, and it is she with whom he ends up at fadeout time. Nat Pendleton goes through his usual paces as comic-opera gangster Knuckles Benedict. Director George B. Seitz, who ground out four films for MGM in 1935, allows the cast of Calm Yourself to mug and glower to their heart's content: some of it is funny, some of it isn't.